A couple dozen wild hogs trapped by locals and sold to Three Suns Ranch in Charlotte County for meat. Florida is trying to build a new meat industry with a problematic animal. 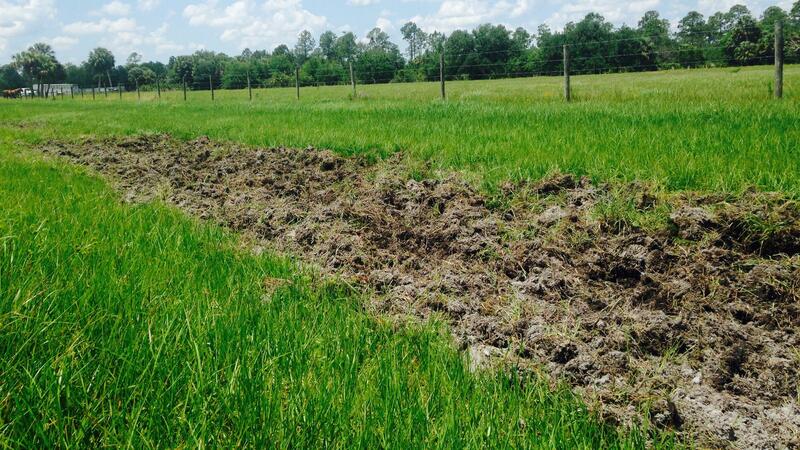 Wild pigs damage land when digging for food, and repairs can get costly for property owners. 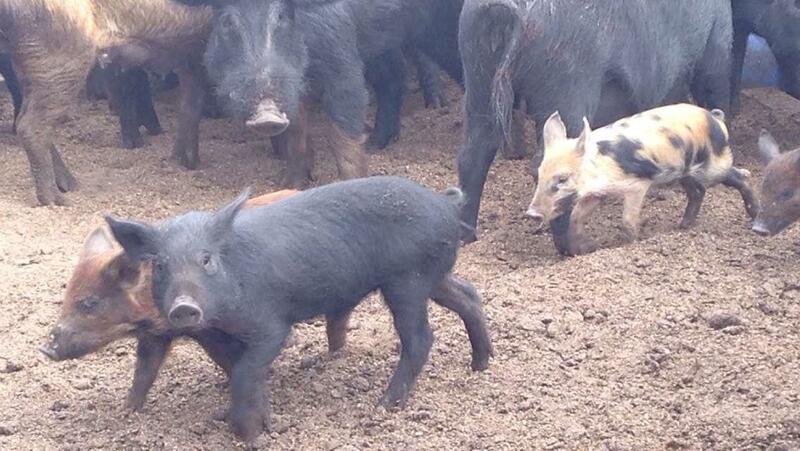 So, some Floridians are turning these pests into profit by marketing wild boar as prime pork. Punta Gorda cattle rancher Peter Madsen with the hog he trapped on his property using corn in his home-made metal cage. Peter Madsen tried to get a wild hog out of his home-made metal cage and into his mobile trailer, by whistling and rattling the fence with a stick. After about 10 minutes of this, the young hog, covered with thick black wiry fur, snorted and stomped in. Madsen slammed the trailer lock shut. 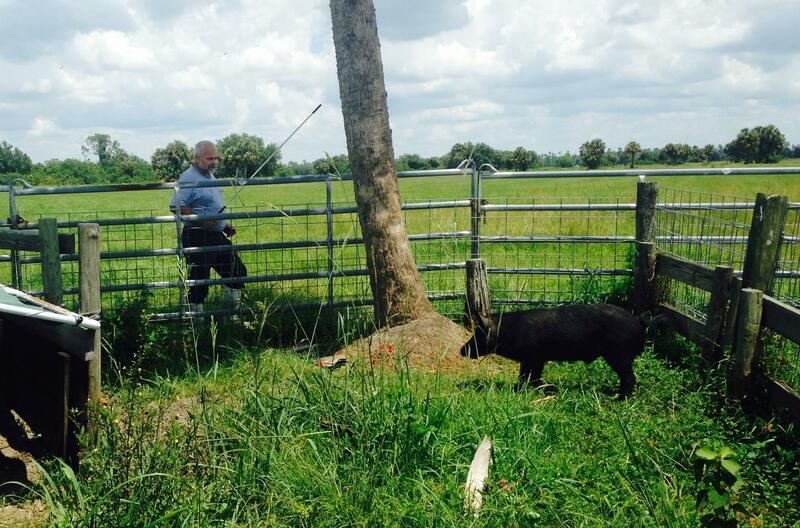 He raises cattle on his 1,200-acre property in Charlotte County. Madsen’s not a pig farmer, but they’re on his land, anyway. He uses corn as bait to trap them. Madsen said this is not a profession—it’s just a way to keep the pigs under control. "If you just go right down the road, I think my wife will show you what they do to the road and to the pastures," he said. So I hopped in a golf cart with Madsen's wife Sharon Rutzke. She drove a few hundred feet away from the metal trap, and stopped at a long patch of freshly dug up dirt. It was about eight inches deep in what was supposed to be a grassy drainage ditch. "It's rough on the equipment and the mowing. And worst of all, it will come back weeds. And weeds are always a problem," said Rutzke. "It just costs money and it makes it difficult to manage a pasture." This is the kind of property damage wild pigs are capable of. The hogs dig up the dirt, and it's costly to fix. She said the wild pigs have been damaging her land for as long as she’s owned it-- more than 30 years. But two years ago they heard about this guy nearby who was buying live feral hogs to butcher them and sell the meat. Madsen said he likes having an alternative to just shooting the pigs. "I think it's nice that they actually have a use for them because just killing them and letting them lay for whoever to eat ‘em… I don’t think that's right ‘cause I don’t think that's why they're put in nature," he said. Jessica Meszaros interviews local wild pig farmer Keith Mann. That guy Madsen sells his pigs to is Keith Mann. "It took a while for people to believe that this was for real and that they could bring pigs here on a regular basis and collect their money," said Mann. He owns Three Suns Ranch in Charlotte County. It’s a working farm with acres of green pastures for grazing bison and cattle. On the property is a small white building where he sells fresh meat. There’s a feral pig pen nearby. As Mann walked toward it, a couple dozen hogs took off running and trampled each other. Florida is second in the country for number of wild hogs with about 500,000. Texas is first with more than 2 million. Mann got into the wild hog meat industry about two years ago because locals kept asking him to. Now that he’s in it, he hopes Florida will eventually mirror the Texas feral pig industry. "Texas is the center of the universe for wild pig processing," said Mann. "They do the vast majority of the animals in this country." Texas has about 100 wild hog meat buying stations. In Florida, only Mann’s ranch and another place in Glades County legally sell this pork. 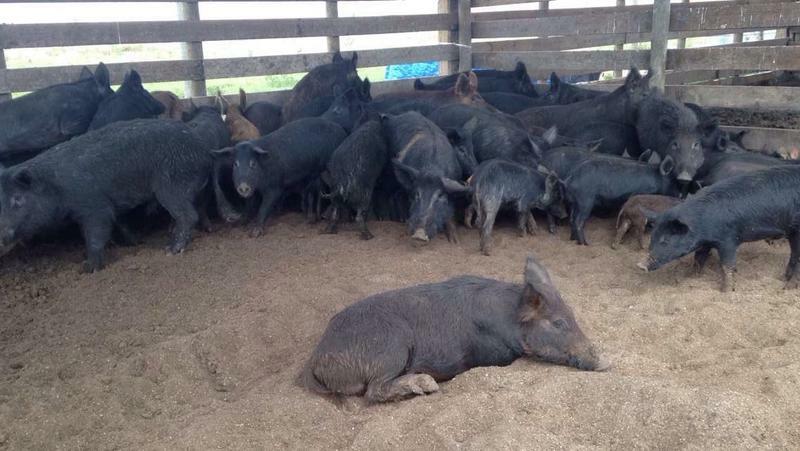 Mann said this industry is self-sustaining because feral pigs reproduce quickly, and year-round. "I think we're at the beginning of a much larger enterprise. And we have a couple of hurdles to clear, but it's gonna be neat here in the next few years," he said. Mann said his business has grown due to word-of-mouth. He now slaughters between 50 and 100 feral pigs a week. Most of Mann’s regular customers are high-end restaurants, like The Beach House on Anna Maria Island. 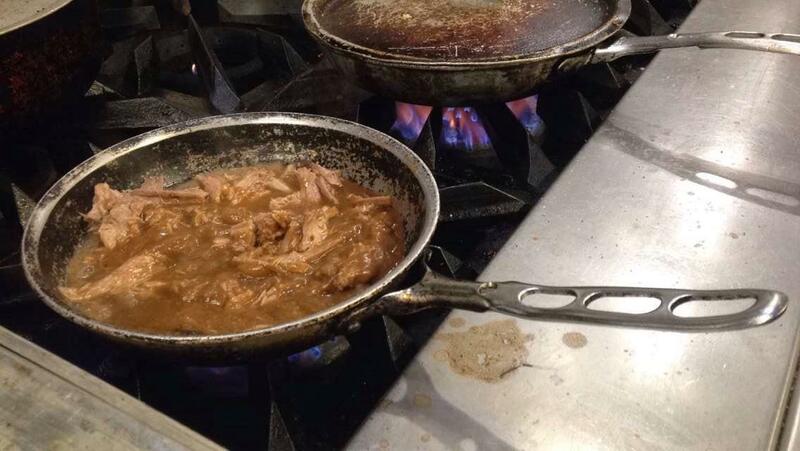 In the restaurant’s kitchen, wild hog meat sizzled in a hot pan. Chefs prepared it with a red wine demi glaze, sautéed kale, and potato cakes. Ed Chiles owns this restaurant and two others where he sells Keith Mann’s hogs. Chiles grew up in Florida, eating wild hog. And he said he’s been wanting to work it into his dishes for a long time. "In a day where people are concerned about where their food comes from and they don’t want GMOs and hormones and antibiotics or concerned about how things are raised, wild pig is an opportunity to take something that is an invasive species and a problem and turn it into something great," he said. Chiles said he sells about 250 pounds worth of wild pig meat a week. On a Friday night, regular customers like Sandy Blackledge and her friends enjoyed sharing the “Wild Boar” dinner plate. Blackledge said it’s... unique. 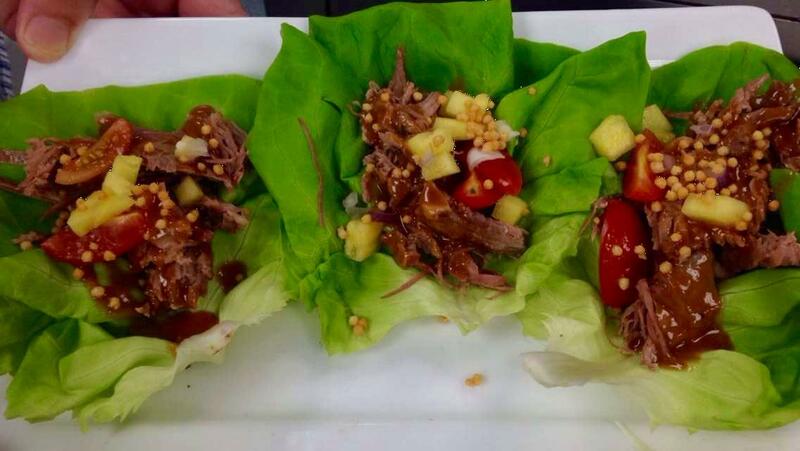 Hog Thai's appetizer at The Beach House: Wild hog with pineapple, cherry tomato, red onion and peanut sauce wrapped in bibb lettuce. "I can’t say it tastes like the pork we're used to. And we like wild game, anyway. Although , this does not have a wild taste at all," said Blackledge. "It's just very mild and easy to digest." Florida hog trappers, ranchers and restaurateurs want more customers like Blackledge and her friends-- people who are willing to try this dish. More people eating the state’s wild boar means this new industry can grow.